Time has a way of getting away from us. 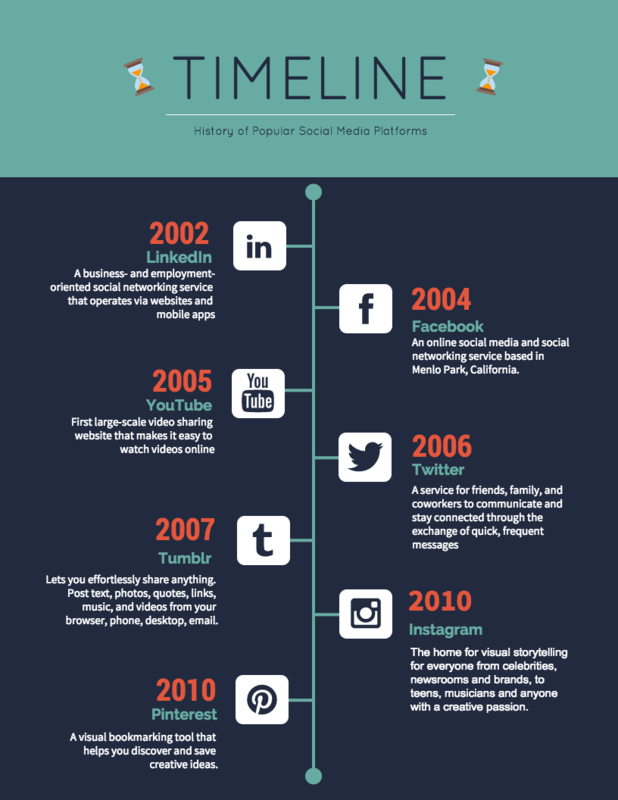 A visual timeline infographic can keep you on track. Timelines are perfect for telling stories and visualizing projects and processes. You can use a timeline to give an overview of events, to highlight important points in time, and reveal things that people might have missed. 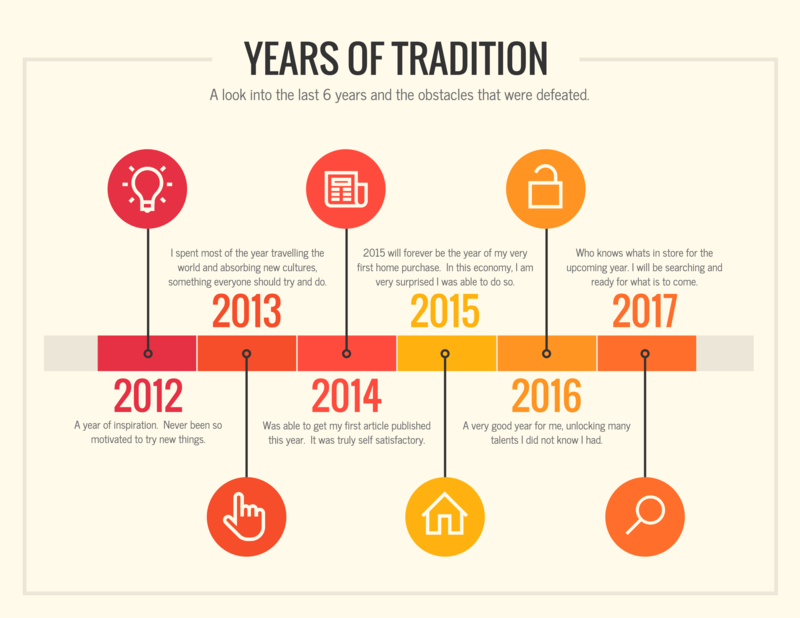 If you start with a creative and visually-engaging timeline template, you can make a timeline that people will want to stop and take the time to read. Pick a timeline template that fits the story you want to tell. Add, remove, or rearrange points in time using the drag and drop canvas. Customize the colors, fonts and icons to make the design your own. 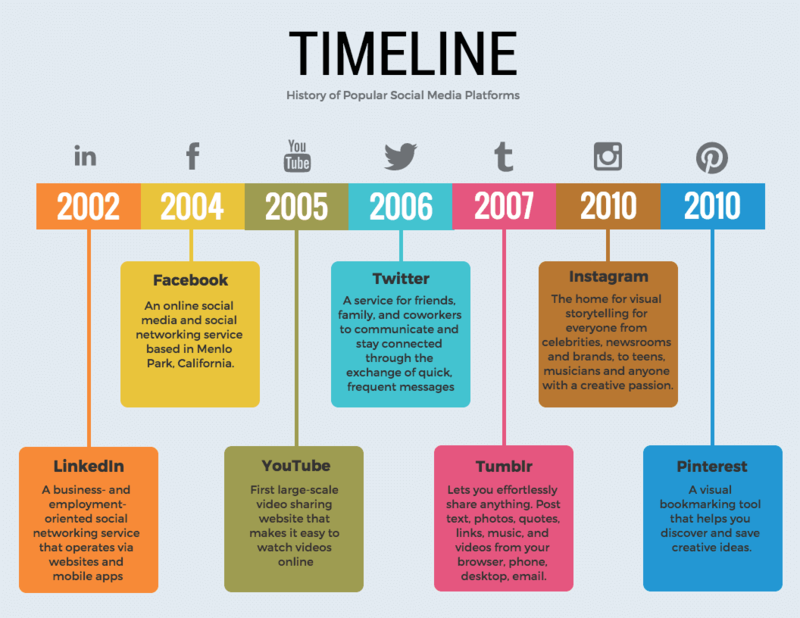 Here are 36 timeline templates and examples for how you can use them. Color coding data in your timeline is one of the easiest and most effective ways to make your design readable. Use distinct colors for each year, important dates, or specific events that you want to stand out from the timeline. In this timeline template, weeks are color coded. So, step one and two should happen in week one (green), for example. 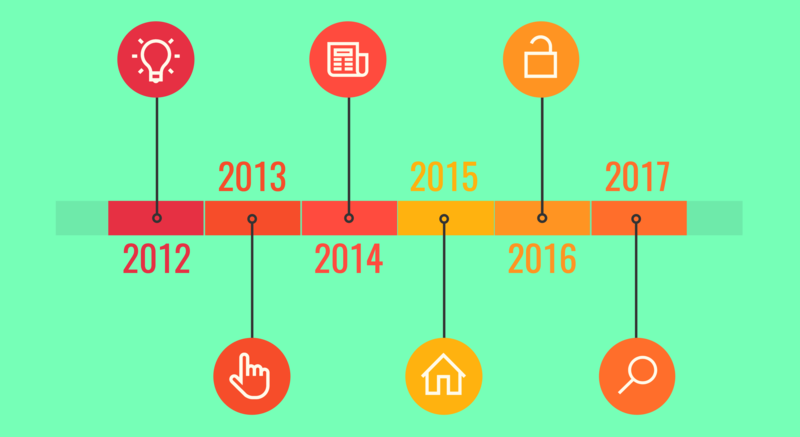 This timeline template uses color to highlight different years. Visual template are an effective way to plan your business goals. You can lay it all out, summarize steps, and use visuals to emphasize points. 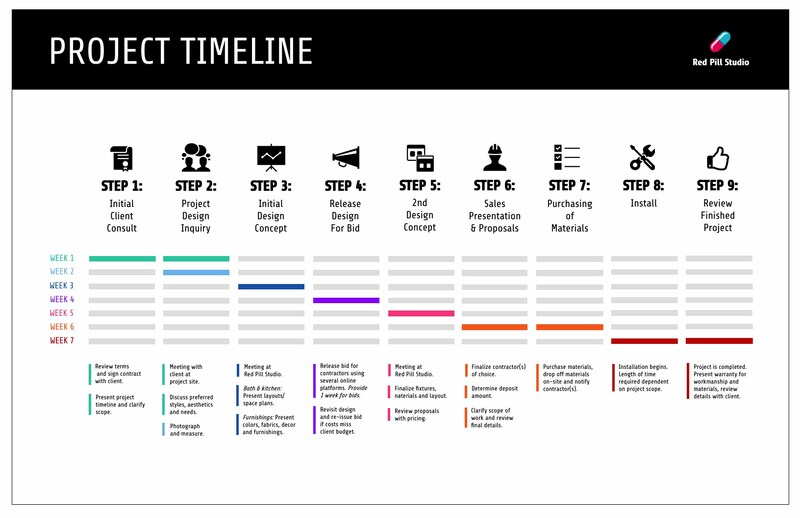 Pro Tip: Consultants and freelancers will especially benefit from using timeline templates. 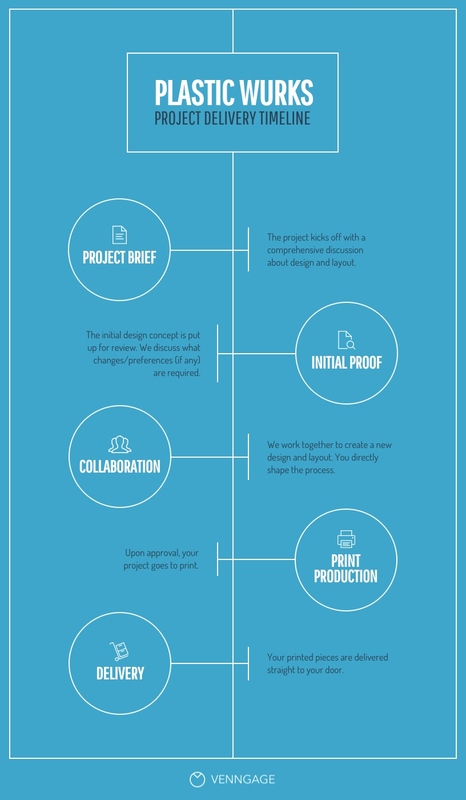 They’re an easy way to show the client what steps are required to complete a project and how each step impacts the next. The client will love having a visual guide to refer to again and again when they can’t remember what’s supposed to happen when. And this means less emails and phone calls to you–we hope! Check out our 15+ project plan templates post for more ideas on how to plan your business goals. 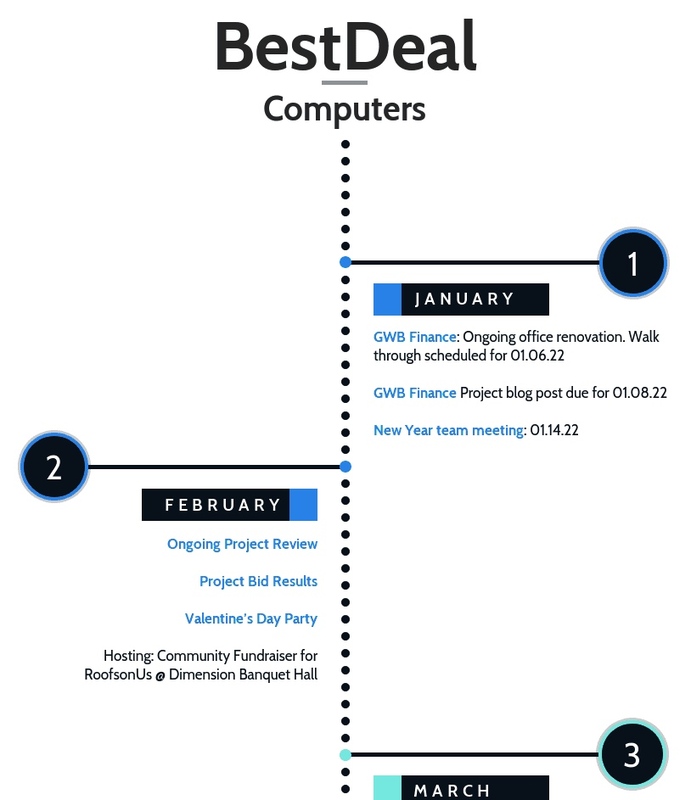 Or check out Gantt chart templates for more ideas on how to visualize projects. Text-only presentation slides are boring. 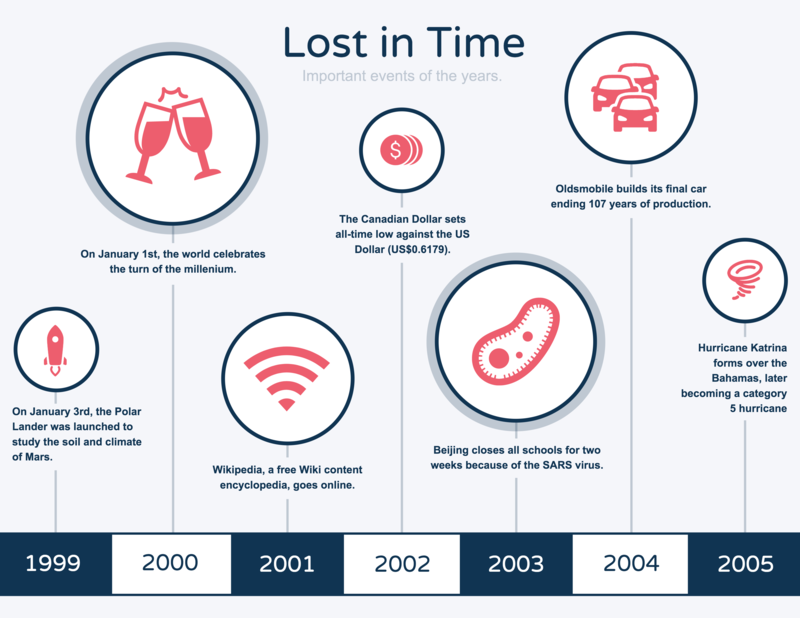 Timeline infographics are perfect for making information visually engaging. Optimize your timeline for PowerPoint, Google Slides or SlideDeck by using a landscape orientation and big, bold text. Use a gradient color scheme to create a flow from the beginning of your timeline to the end. Want your event to go off without a hitch? 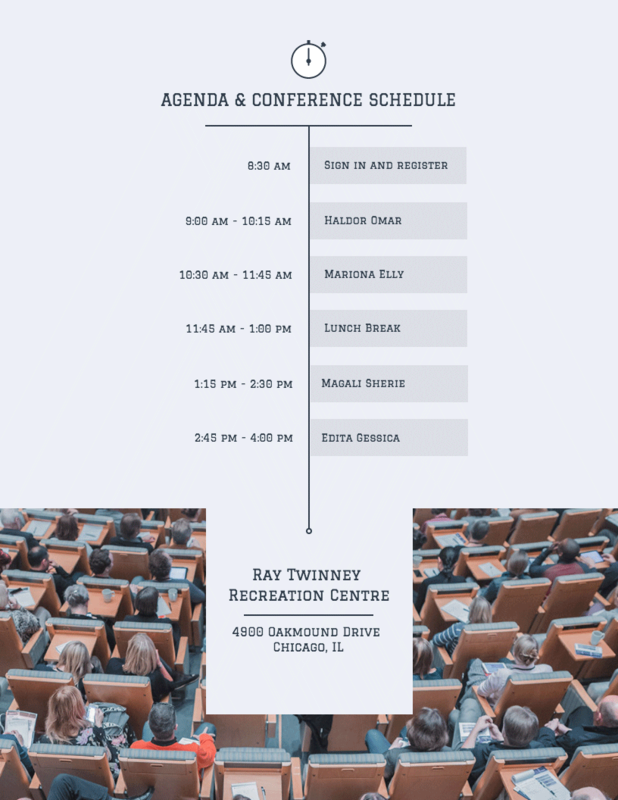 Give your attendees a timeline of what the day will look like. That way, they’ll know what to expect ahead of time. Don’t forget to include information about where each part of the day will take place. Including photos or illustrations of what to expect can also help get your attendees excited about the day’s events. Pro Tip: Special event consultants and event planners of all stripes can add their branding and format the template to their liking. Then, save it as a template to use again and again. Meaning: less administrative work for you. Keep track of your team’s progress week over week with a simple and organized timeline template. Use icons to categorize different types of tasks so that readers will be able to skim the timeline and find the information quickly. Alternate between two neutral background colors to increase the readability of your design. 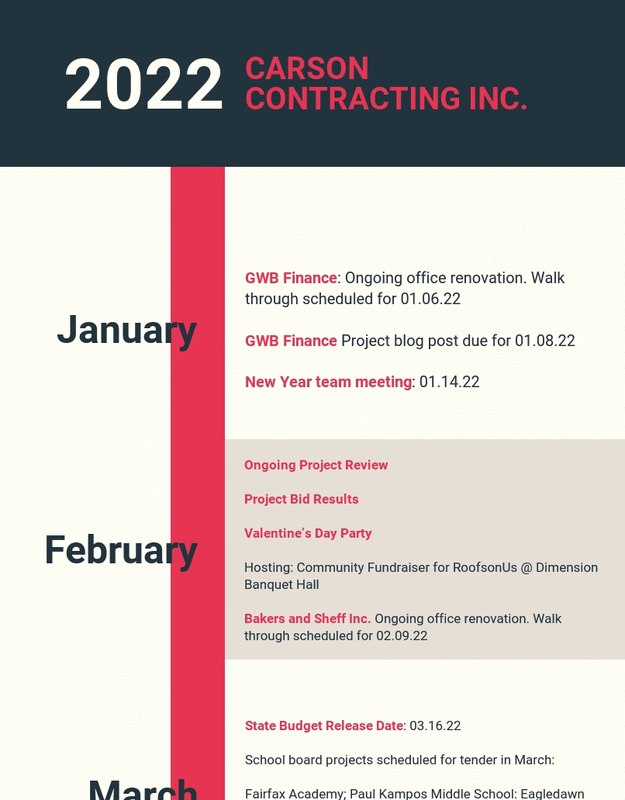 Pro Tip: A timeline template can be a fresh way for consultants to make progress reports for stakeholders. The client can see at a glance what you’ve been up and how the project’s progressing. 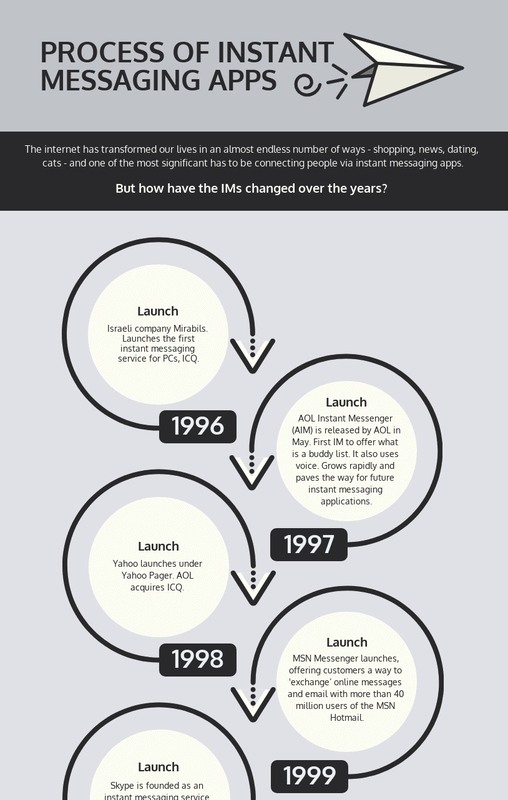 No wading through walls of text–a timeline is easy to scan and understand. 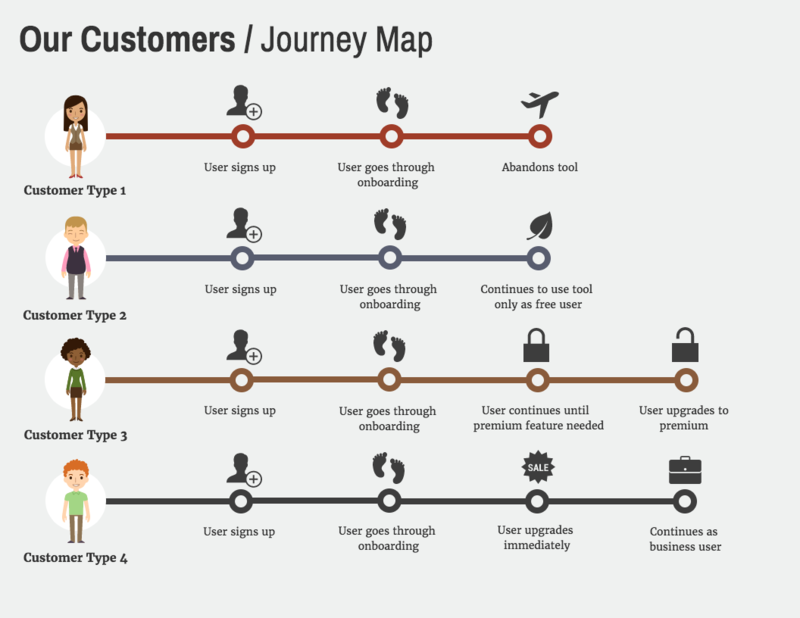 Understanding your customers’ journey is a core component of a solid customer experience. Create an infographic that visualizes your various customer profiles. Use icons to emphasize key steps in their journey. 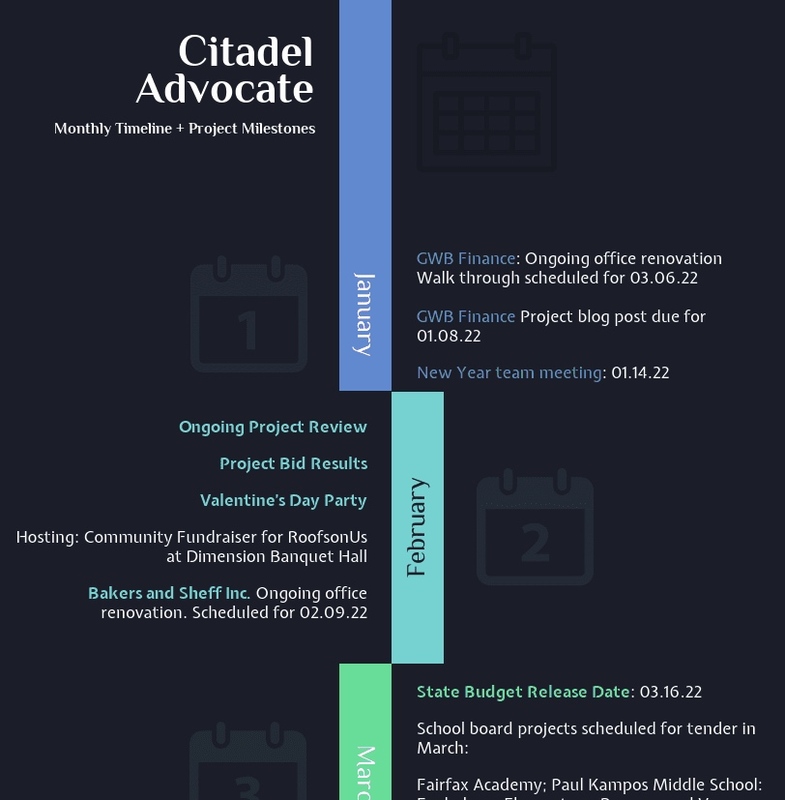 The beauty of a timeline infographic is that you can create a design that really reflects the theme of your information. Pick a flat icon that reflects the theme of your information and stretch it to fit the background of your page. Then, pick a color that stands out to create your timeline, text and smaller ilustrations. Do you want to keep your team–and yourself–on track? 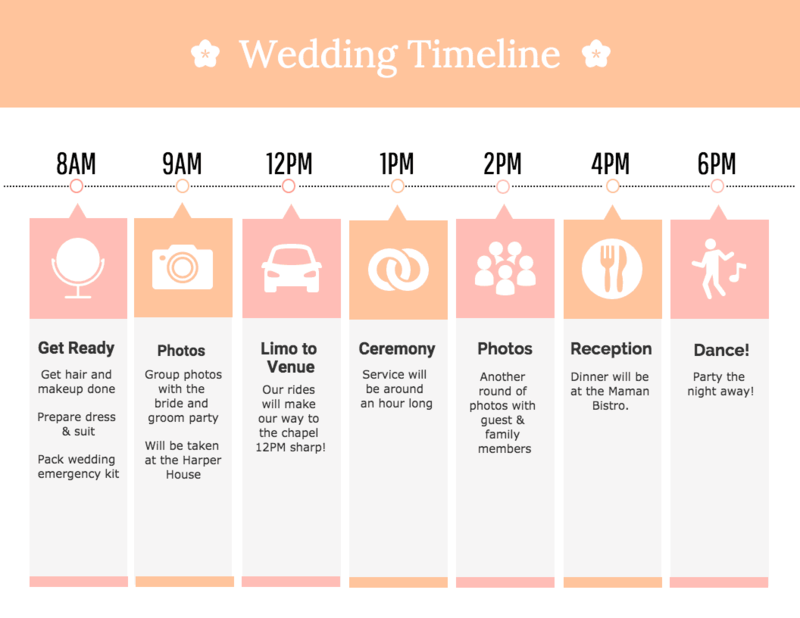 A simple day plan timeline is a great way to sum up the events and tasks for an important day. Click “Week 1” and change it to “9 a.m.”, for example. 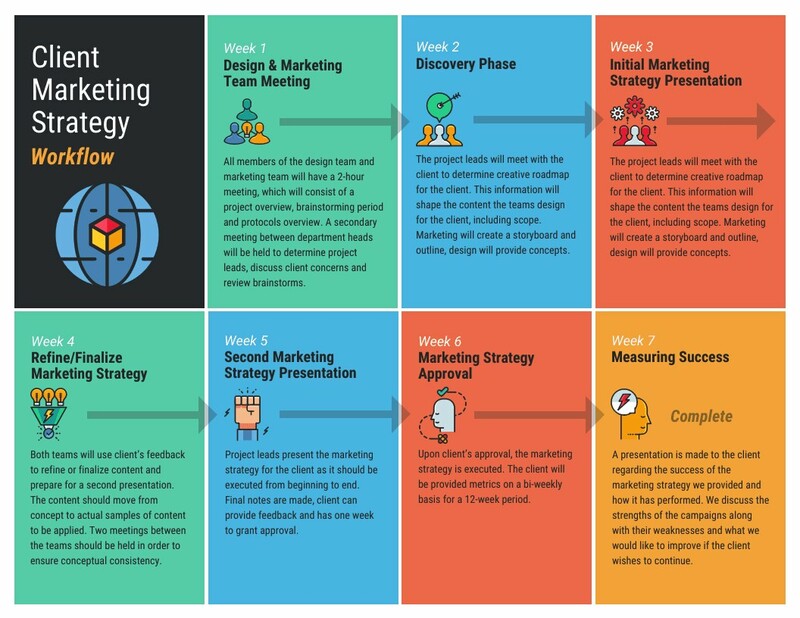 Consultants can also add this timeline template to their marketing plan to help clients change up their workflow. A more efficient workflow will help the client’s team effectively carry out your recommendations. Icons visualize information in one small graphic. That’s why they’re perfect for including in visual timelines. Pick an icon with a widely recognizable meaning (for example, social media platform logos) so people can scan your timeline for information about a specific topic. 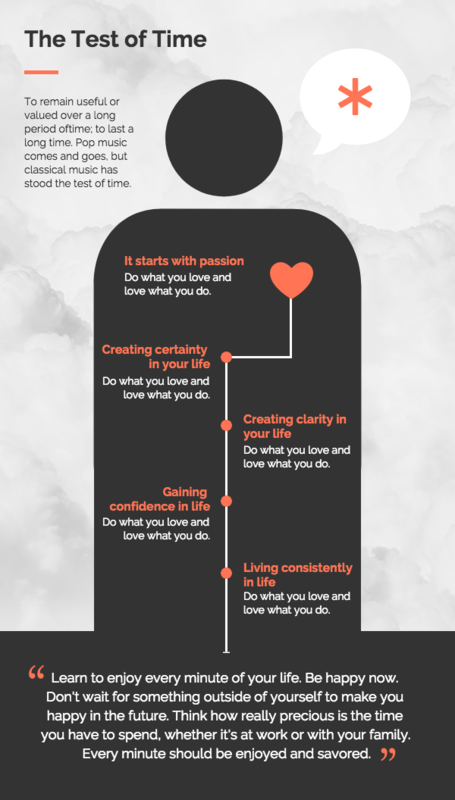 Pro Tip: Timeline infographics are great for consultants looking to become thought leaders. Pick a topic that shows the development of an idea or product in your industry. Plot it into a timeline template and insert it into your blog posts or guest posts or share it on social media. Add it to a white paper, too. 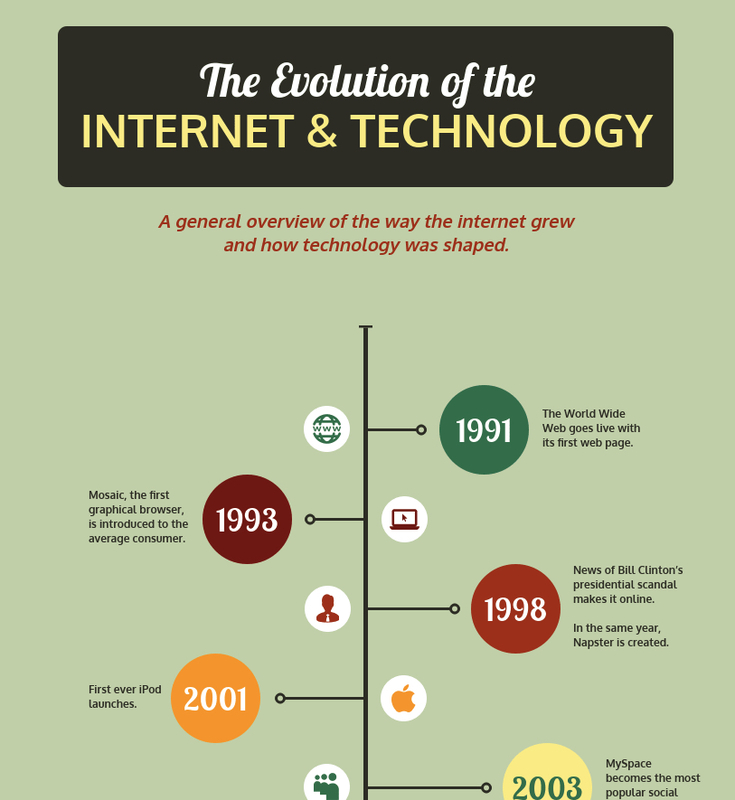 It’s fun to see how things have changed over the years–tech, fashion, event foods. Create a visual timeline that shows photos of a thing, to highlight how it has changed over the years. 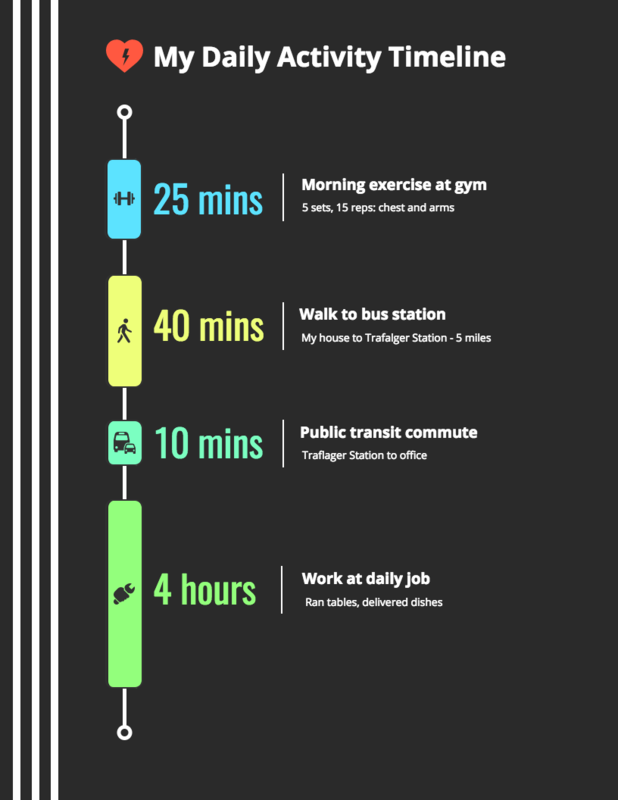 You can use a comparison infographic template to do this. 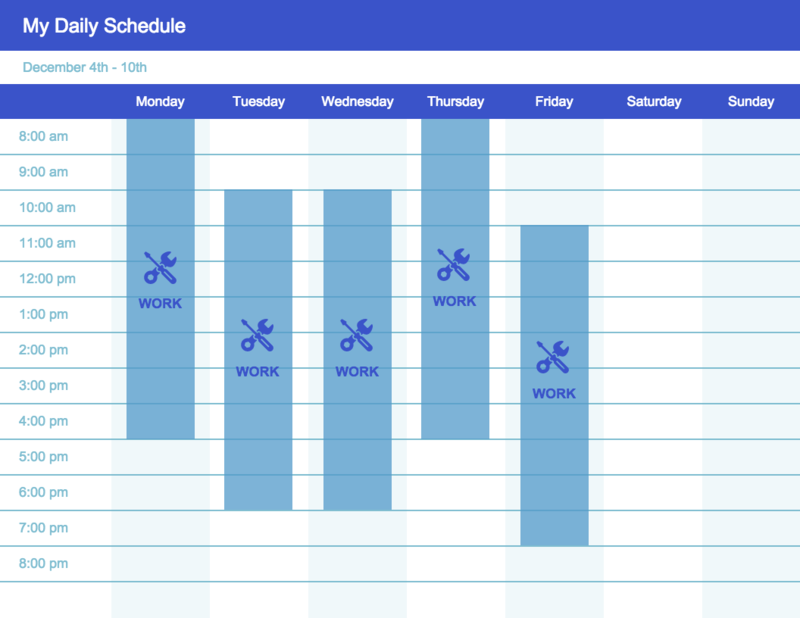 Scheduling your days in time blocks can be an effective way to organize and prioritize your tasks. Try using different colored blocks for different types of tasks or appointments. This is another opportunity where icons can help you code information, to make it easier to scan your timeline. 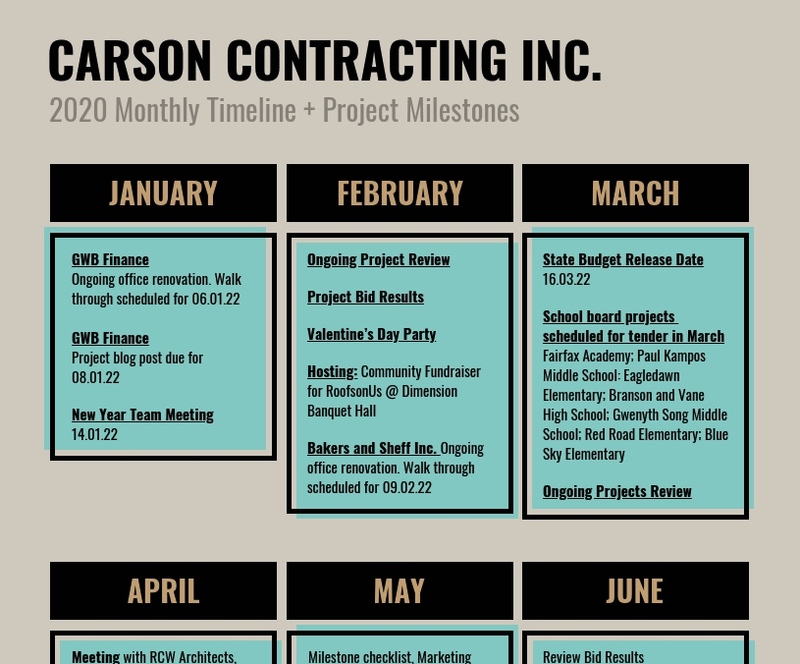 Pro Tip: Consultants can use timeline templates to keep a project on track, especially if there are multiple people involves (subcontractors, multiple stakeholders etc.). Assign a task to a different person and color code these people/companies i.e. green for you, red for the client. PS: If you’re looking for a free scheduling app to help you book meetings without the back-and-forth, check out HubSpot’s Meetings tool. If you’re a busy person who needs to budget their time, indicate how long should be spent on each activity in your timeline. One way to do this is to use bars of different lengths to visualize lengths of time. People often like to learn about the history of people, places, and things that they’re interested in. 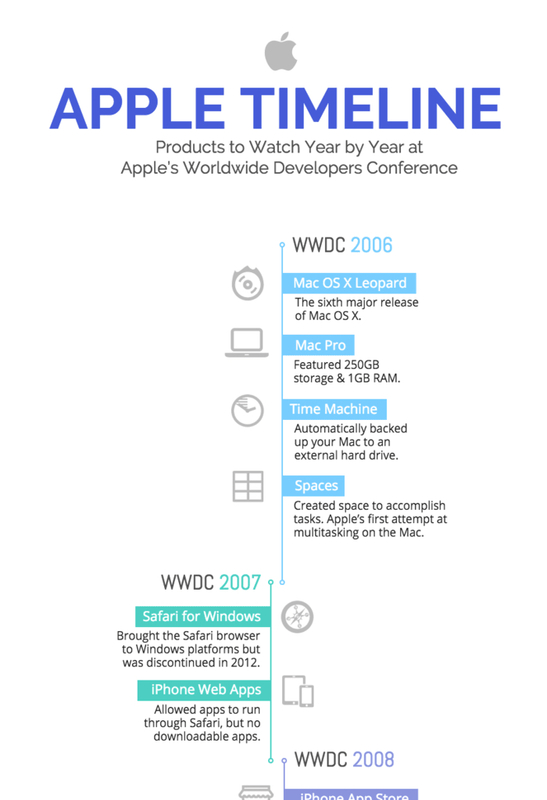 For example, this timeline template highlights the major product announcement at each Google I/O event since the first year it was put on. 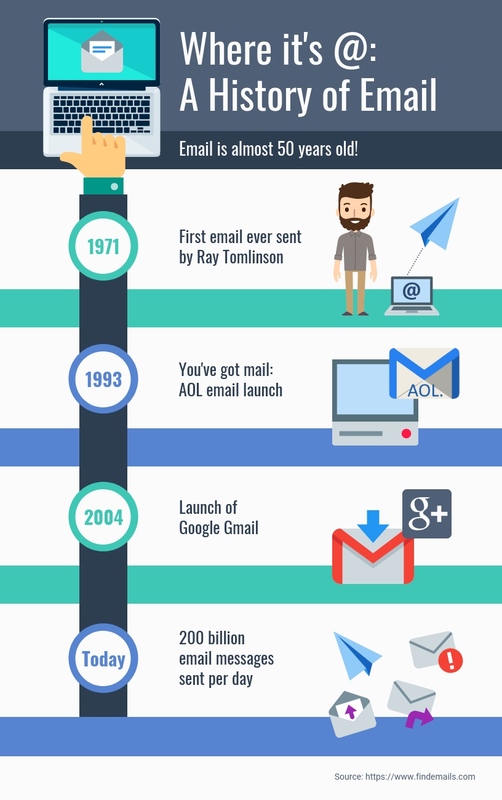 This timeline uses Google’s iconic color palette to reflect the story. Icons and logos make it easy for readers to skim the timeline and find their favorite products. Sometime, processes can be confusing, especially if there are a lot of steps to follow. It’s easy for people to forget steps in a process. 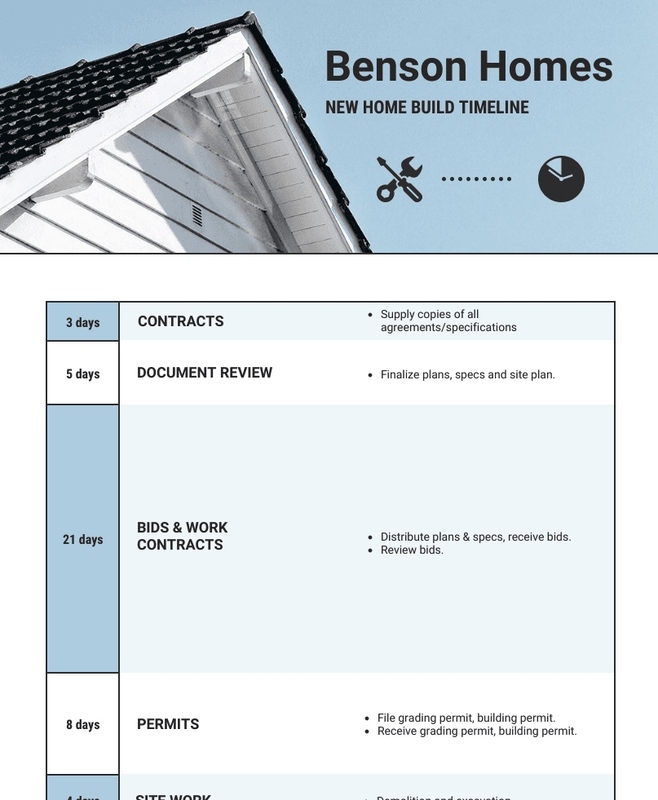 A process timeline visualizes a process, organizes the steps, and shows the connections between steps. Numbering each step on the timeline will make the information especially easy to follow. Use your brand’s colors, fonts and logo to spread brand awareness and make your content recognizable across multiple channels. Pro Tip: Design newbie consultants and freelancers can use our “My Brand Kit” tool to import brand colors and logos from a website. Or enter them manually. Use your branding, or the client’s, as you like. It’s an easy way to impress the client, without any design work on your part! 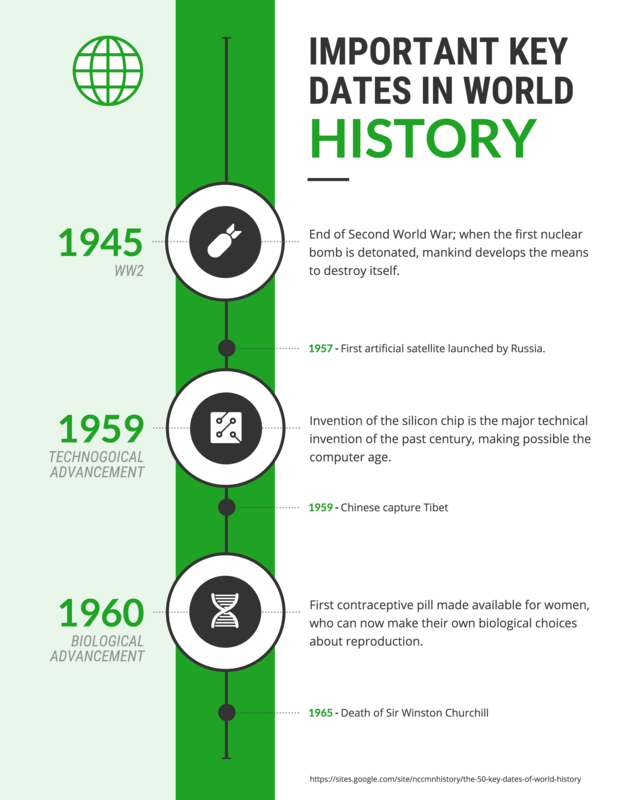 Educate and remind readers about important dates in history using a timeline. Emphasize certain dates by using big, colorful fonts. Offer brief, concise explanations for why the dates are important. 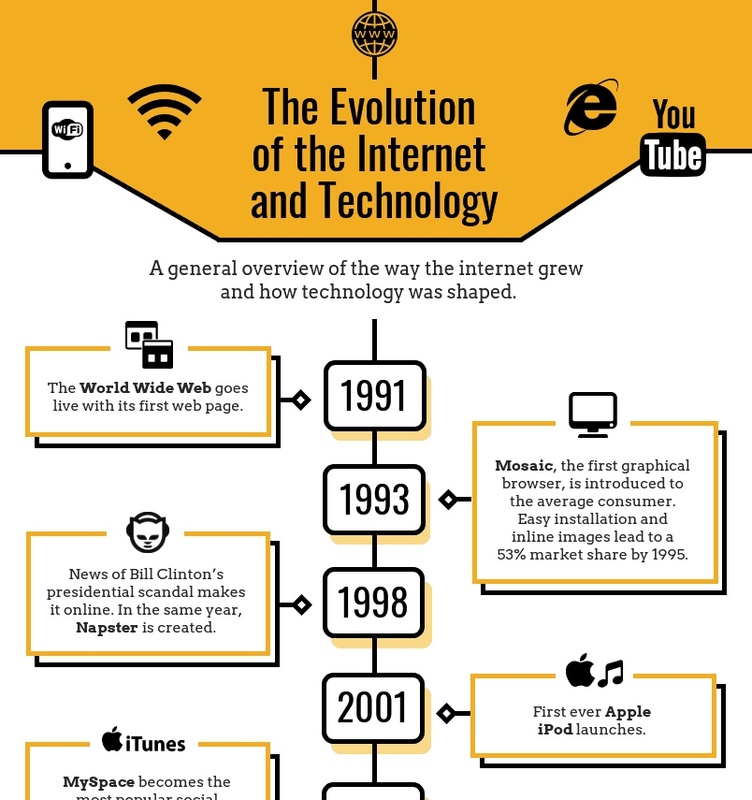 If you are pulling your information from other sources, be sure to cite your sources at the bottom of the infographic. If you publish your infographic on Venngage’s community page, you can even include an active link for readers to follow to get more information. 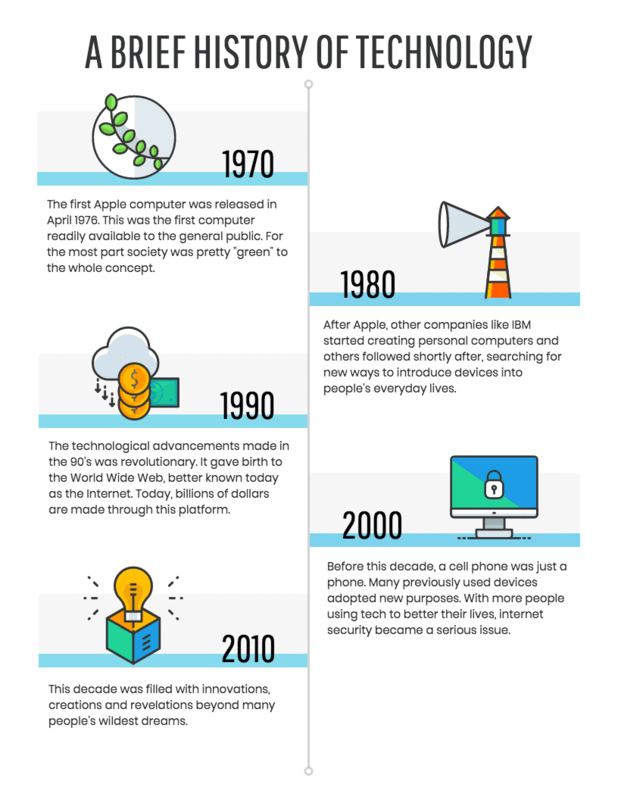 Pro Tip: Use a timeline template to show the history of your business. Put it on your website’s About page to grab the reader’s attention. You can also add it to proposals or pitch decks. 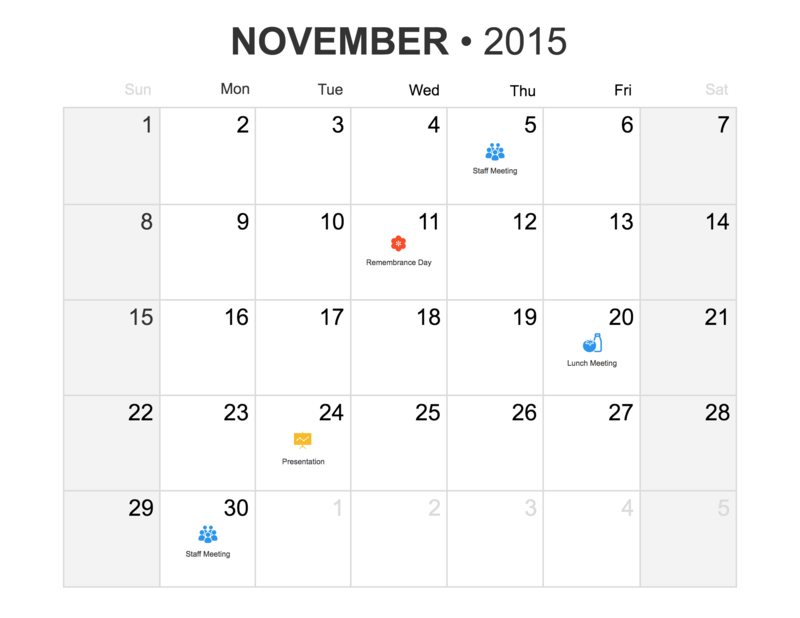 Take a classic calendar and make it more effective by using icons. Pick icons to represent different types of events…and don’t be afraid to mix up the colors! Simple visuals make information easier to remember, so pick icons that will stick in your memory. Choose icons to fit your events using Venngage’s library of over 40,000 icons. While most timeline typically use one connecting line down the middle to show progress over time, you can group years together using horizontal lines. Group periods according to different technological breakthroughs, political movements, artistic and fashion trends, or any other broad theme. 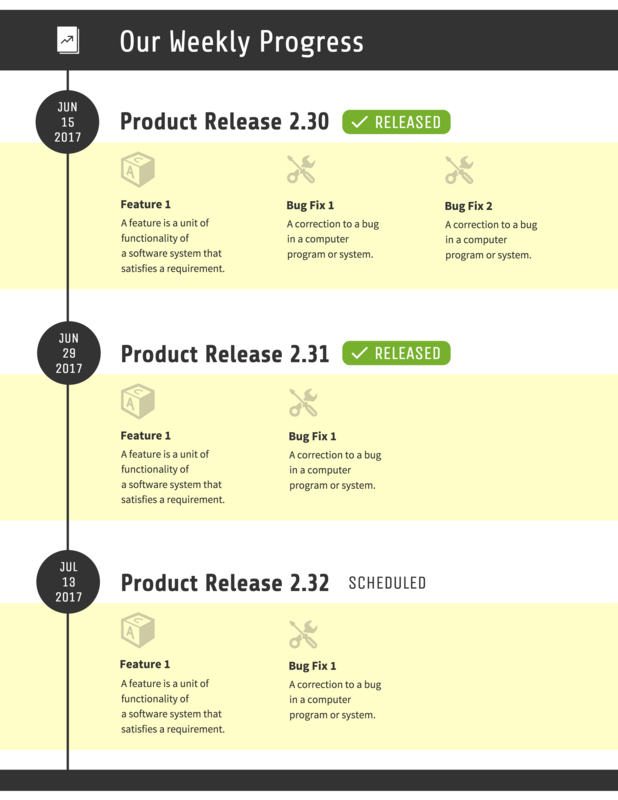 Don’t be afraid to stray away from the classic branch timeline design. 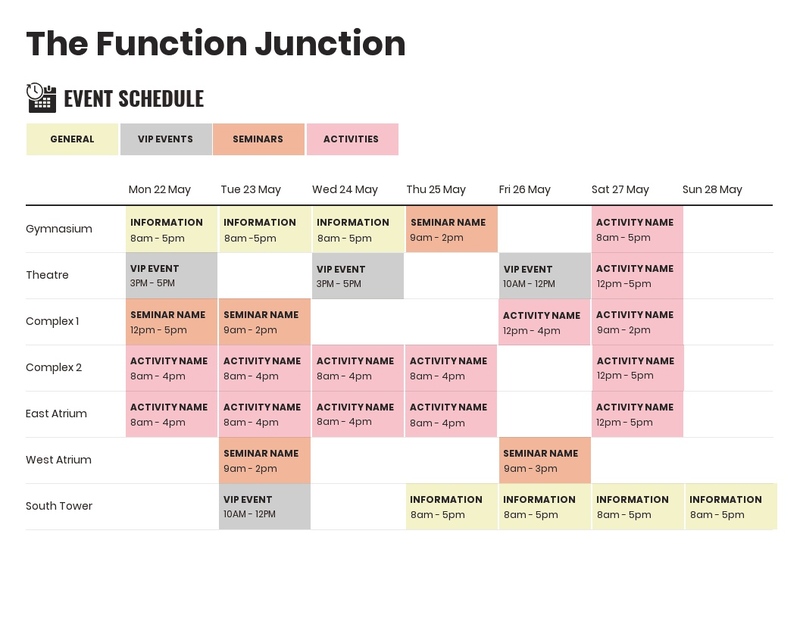 Get creative by moving events around the page and playing with different layouts. If certain date or events are particularly important, emphasize them on your timeline by making them bigger than other dates. You can do this by using bigger icons, bigger font sizes, or using a contrasting color. Not only will using non-uniform design elements make certain points stand out, they will also make your timeline more interesting to look at. A timeline doesn’t necessarily have to chronicle years. It can also be used to count down information. Take this timeline template that counts down New Year’s Eve facts. The line down the middle of the infographic creates a flow from fact to fact. You could use a template like this to rank products, websites, movies…anything! While you can’t cover everything that has happened in history in one timeline, you can highlight the important, defining events. Summarize the history of a person, place or thing by showing key moments in history and offering concise explanations of why those moments are significant. Use colorful icons to enforce and illustrate the information. If you have a resource where readers can go to get more information, cite it at the bottom of the infographic. These political infographic templates are a good place to start. Need some more design tips? 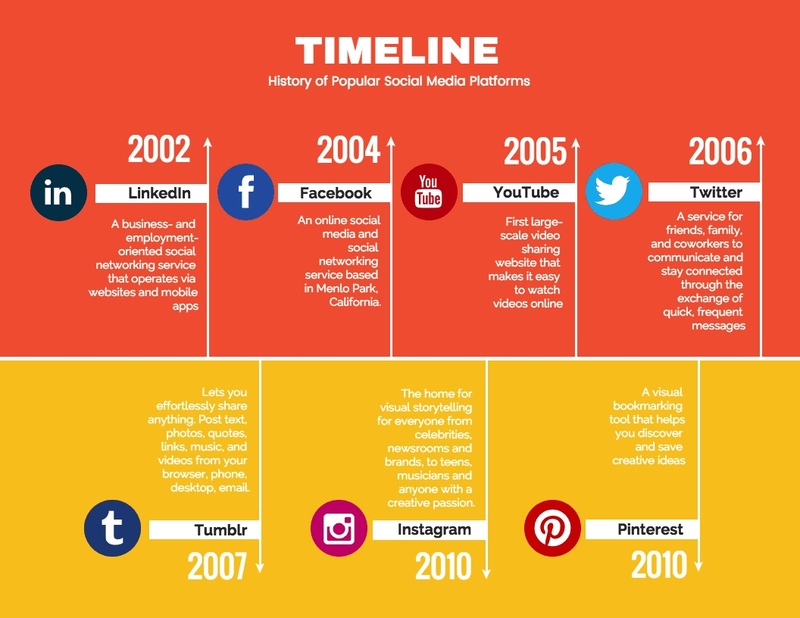 Read our guide on how to create a timeline in 6 easy steps.